Teflon(PTFE) Coated Glass Fabric Tape is using glass cloth base material impregnated with PTFE (polytetrafluoroethylene) dispersion and then sintered. Single surface treated and coated with a high-temperature, silicone pressure-sensitive adhesive.Youngsun PSA products can be supplied as log rolls or slitted tapes. 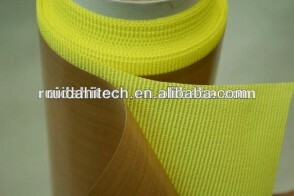 Yellow textured PVC release liner is applied to the adhesive surface for ease of application. Self-wound rolls are available (without liner). The non-adhesive side exhibits excellent characteristics of polytetrafluoroethylene such as electrical properties, resistance to heat, weather, chemical, and water (water-shedding), and non-adhesiveness.